The Zojirushi EC-DAC50 Zutto 5-Cup Drip Coffeemaker is an excellent little drip machine that brews a phenomenal cup of coffee. It’s attractive design, genius engineering, and incredible performance make it one of the best brewers on the market. 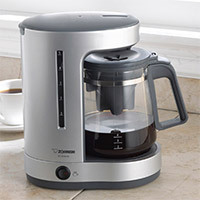 It also happens to be the cheapest high-end brewer available. Don’t let the reports of defective boilers deter you—the risk is well worth it. Zojirushi, a Japanese based multinational manufacturer, is best known in North America for its high-end precision water boilers. One of their lesser-known offerings, scarcely available in North America, is the Zojirushi EC-DAC50 Zutto 5-Cup Drip Coffeemaker. The Zutto is a fantastic high-end brewer, boasting the same incredible temperature precision that Zojirushi boilers are known for. Much like the Technivorm and Bonavita brewers, the Zojirushi Zutto is a high-end coffee maker of the no-frills variety. This tiny Japanese machine has a single purpose: to make the best coffee you’ve ever tasted. Coffee experts and hobbyists alike seem to believe its purpose has been fulfilled; the Zojirushi EC-DAC50 Zutto 5-Cup Drip Coffeemaker is one of the best brewers available. The primary reason for Zojirushi Zutto’s universal acclaim is its incredible temperature precision. Beyond all odds, its miniature 850 watt boiler manages to reach and maintain a consistent temperature range of 200° – 205° F, Easily outperforming every 4-cup brewer on the market. But temperature precision is only a small part of the story. The Zojirushi EC-DAC50 Zutto 5-Cup Drip Coffeemaker boasts an ingenious engineering solution to some of the most pervasive auto-drip pain points. From the lowliest Hamilton Beach to the mightiest Technivorm, all filter based coffee brewers share a common nuisance: the dreaded coffee leak. Irrespective of build quality, materials, and complex engineering, the culprit always seems to be the connection point between filter baskets and carafe lids. Ignoring overly complex engineering “solutions” that miss the point entirely (flow controls, safety actuators, brew-thru lids etc. ), the Zojirushi Zutto offers an incredibly simple solution. Zutto’s filter basket is the carafe lid. In one fell swoop, several long-standing brewer issues are solved: coffee leaks become physically impossible, heat retention increases, and maximal compactness is achieved. Not only does the filter-lid prevent leaks and increase heat retention, it also eliminates the need for a fancy showerhead. The key to this feat lies in the filter-lid’s star-shaped opening, which distributes hot water across the coffee grinds more uniformly than is possible with a suspended showerhead. Combining the Zojirushi Zutto’s excellent temperature precision, optimal heat retention, and incredible grind saturation results in a sublime cup of coffee. This tiny brewer can easily go toe-to-toe with the biggest and priciest brewers on the market, and in many cases, it would win. 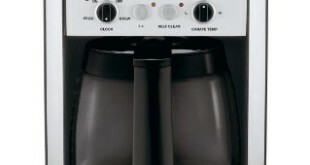 The Zojirushi EC-DAC50 Zutto 5-Cup Drip Coffeemaker also features a removable water reservoir, a hotplate, and a permanent charcoal water filter. In contrast to the right angles and well-defined geometry of Technivorm’s minimalism, the Japanese minimalism of the Zojirushi EC-DAC50 is shapeless, flowing, and graceful. It is characterized by subtle curves, delicate bevels, and a near complete absence of corners. This mind-boggling design exhibits only two flat surfaces: one on the base of the machine, and the other on the carafe platform. All other elements are solely comprised of intersecting curvatures. These seemingly endless curves create the illusion of a shape-shifting silhouette; the slightest changes in viewing angle delicately transform the machine’s silhouette, revealing new curves and hiding old ones, flowing in and out, ad infinitum. The EC-DAC50’s ambiguously colored faux-metal finish only serves to add to the intrigue, complementing the minimalistic theme well. It is also a deeply refreshing change of pace from the stainless steel and black plastic found on virtually every brewer. The Zojirushi EC-DAC50 is a beautiful, unique, and ultimately mysterious looking device, and there’s no brewer quite like it. The Zojirushi Zutto will exude intrigue and mystery anywhere you put it, and is bound to draw some attention from visitors. For a machine made almost entirely out of plastic, the Zojirushi EC-DAC50 bolsters a surprisingly high quality build. The faux-metal enclosure feels sturdy, and its construction appears seamless. The power button has smooth, firm action, offering the perfect amount of resistance with minimal play. The top lid and water reservoir can be effortlessly removed, and easily locked back into place. The most apparent issue with Zojirushi’s build is the dubious design of the carafe’s handle. The top of the handle is secured to the carafe by a single steel band, wrapped around the upper portion of the glass. The remainder of the handle hangs loosely, completely unsecured. Picking up the carafe yields noticeable bending in its flimsy handle, which leads to a twisting of the steel band. Predictably, many customers have reported broken glass, cracked handles, and dislodged bands. Thankfully, Zojirushi sells cheap replacement parts directly on its website. Another, more insidious issue plagues the Zojirushi EC-DAC50. There are several dozen customer reviews claiming that the machine doesn’t hit optimal temperature until the last 1-2 minutes of its brew cycle, resulting in subpar coffee. Even worse, it is impossible to tell how common this defect is, given how few people actually track their brewing temperature. If you’re one of the unlucky folks that purchased a lemon, you can still brew at optimal temperature with a small workaround. The defective units seem capable of reaching the ideal temperature, just not quickly enough. If you pre-heat the boiler by brewing half a pot of water, your next batch should be able to sustain a brew temperature of 205° F.
How Much Does The Zojirushi EC-DAC50 Zutto 5-Cup Drip Coffeemaker Cost? We partnered up with Amazon to provide you the lowest price for the Zojirushi EC-DAC50 Zutto 5-Cup Drip Coffeemaker. Please note, the Zutto may be out of stock once in a while due to limited availability.